There’s more doom and gloom in the tablet world this morning, as new figures show a major dip in global sales, with even Windows tablets – which have previously bucked the overall downward trend – now slumping. According to the latest shipment numbers for Q1 from Strategy Analytics, worldwide tablet shipments fell to 42.1 million units from 46.7 million in the same quarter last year, representing a hefty drop of 10%. Naturally, the majority of models sold were Android tablets – 26.9 million of them to be precise, giving Google’s OS a market share of 64%. Android was still down 11% year-on-year, though. Apple sold 8.9 million iPads (less than expected) to give it a global market share of 21%, and as mentioned, Windows tablets floundered, selling 6.3 million units in the past quarter, which represented a drop of 2% year-on-year – leaving them with a market share of 15%. Compare that to the Q3 2016 tablet figures from Strategy Analytics, which showed a massive 25% growth year-on-year for Windows slates, and you can clearly see the magnitude of this reversal. The issue with Windows tablets? 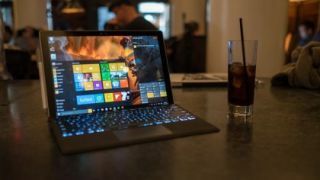 Part of the problem is that Microsoft’s flagship Surface models simply haven’t been refreshed for a long time now – and there was no sign of a hybrid (detachable) successor at the firm’s recent press event, either (although we did get a Surface Laptop). As Eric Smith, a senior analyst at Strategy Analytics, observed: “Sales performance for Windows Tablets has been fantastic over the last several years but the hero of this segment is missing in action. When it comes to the individual tablet vendors, Apple is of course still in the lead with its 21% market share, followed by Samsung on 14.3%, and Huawei is now in third position on 6.7%, ahead of Amazon on 5.7%.